‘The review shows that cultural safety in service provision, increased participation in breast, bowel and cervical screening and reduction in risk factors will improve outcomes for cancer among Aboriginal and Torres Strait Islander people. The good news is that many cancers are considered to be preventable. Lung cancer is the most commonly diagnosed cancer among Aboriginal and Torres Strait Islander people, followed by breast cancer, bowel cancer and prostate cancer. Tobacco smoking is still seen as the greatest risk factor for cancer’. Aboriginal and Torres Strait Islander Community Controlled Health Services are located in all jurisdictions and are funded by the federal,state and territory governments and other sources . Strait Islander communities and aim to deliver holistic and culturally appropriate health and health-related services. Services vary in the primary health care activities they offer. Possible activities include: diagnosis and treatment of illness or disease; management of chronic illness; transportation to medical appointments; outreach clinic services; immunisations; dental services; and dialysis services. Aboriginal and Torres Strait Islander cancer support groups have been identified as important for improving cancer awareness and increasing participation in cancer screening services . understanding of screening and reported less fear and concern over cultural appropriateness, with increases in screening rates . The Australian Indigenous HealthInfoNet (HealthInfoNet) at Edith Cowan University has published a new Review of cancer among Aboriginal and Torres Strait Islander people. The review, written by University of Western Australia staff (Margaret Haigh, Sandra Thompson and Emma Taylor), in conjunction with HealthInfoNet staff (Jane Burns, Christine Potter, Michelle Elwell, Mikayla Hollows, Juliette Mundy), provides general information on factors that contribute to cancer among Aboriginal and Torres Strait Islander people. It provides detailed information on the extent of cancer including incidence, prevalence and survival, mortality, burden of disease and health service utilisation. This review discusses the issues of prevention and management of cancer, and provides information on relevant programs, services, policies and strategies that address cancer among Aboriginal and Torres Strait Islander people. There are very few national policies and strategies that focus specifically on cancer in the Aboriginal and Torres Strait Islander population. The National Aboriginal and Torres Strait Islander Cancer Framework is therefore significant as the first national approach to addressing the gap in cancer outcomes that currently exists between Aboriginal and Torres Strait Islander people and the non-Indigenous population . However, over the past 30 years, there have been a number of relevant strategies and frameworks developed addressing cancer in the general population, and broader aspects of Aboriginal and Torres Strait Islander health. A selection of national policy developments relevant to addressing cancer among Aboriginal and Torres Strait Islander people are described briefly below. It was not until the late 1980s that national cancer control strategies and policies began to be developed . In 1987, the first National Cancer Prevention Policy for Australia, was published by the Australian Cancer Society (ACS) (now the Cancer Council Australia) based on a series of expert workshops . It outlined what prevention activities were currently being undertaken, what should be undertaken and suggested a number of goals, targets and strategies in the areas of cancer prevention and early detection and screening. This policy has been updated many times over the years  and is still in publication as the National cancer control policy . The following year, in 1988, the Health for all Australians report, commissioned by the Australian Health Ministers’ Advisory council (AHMAC), recognised that cancers could be influenced by primary or secondary prevention strategies . The report recommended nine goals and 15 targets related to cancers, based on those put forward by the National Cancer Prevention Policy for Australia. Cancer prevention and strategies relating to breast, cervical and skin cancer and tobacco smoking were recommended as initial priorities under the National Program for Better Health. These were then endorsed at the Australian Health Ministers Conference and funding was provided. In 1996, cancer control was identified as one of four National health priority areas (NHPA). This led, the following year, to the publication of the First report on national health priority areas 1996, which outlined 26 indicators spanning the continuum of cancer care, and included outcome indicators, indicators relating to patient satisfaction and the creation of hospital based cancer registries . In 1998, the first NHPA cancer control report was produced . It identified a number of opportunities for improvements in cancer control, including within ‘special populations such as Indigenous people’ . In 2003, the report Optimising cancer care in Australia was jointly developed by The Cancer Council Australia, the Clinical Oncological Society of Australia (COSA) and the National Cancer Control Initiative (NCCI), with strong consumer input . This report made 12 key recommendations, including that the needs of Aboriginal and Torres Strait Islander people be the focus of efforts to bridge gaps in access to and utilisation of culturally sensitive cancer services. In 2008, the National Cancer Data Strategy for Australia aimed to provide direction for collaborative efforts to increase data availability, consistency and quality . It reported that although Indigenous status is recorded by cancer registries, data quality is poor, and recommended that the quality of Indigenous markers in hospital and death statistics collections needs to improve if cancer registries are to have better data. In 2011, Cancer Australia published the first Cancer Australia strategic plan 2011–2014, which aimed to identify future trends in national cancer control and to outline strategies for the organisation to improve outcomes for all Australians diagnosed with cancer . It was followed in 2014, by the Cancer Australia Strategic Plan 2014–2019, which had an increased focus on improving quality of cancer care and outcomes for Aboriginal and Torres Strait Islander people . In 2013, the National Aboriginal and Torres Strait Islander Health Plan 2013–2023 (the Health plan) was developed to provide a long-term, evidence-based policy framework approach to closing the gap in disadvantage experienced by Aboriginal and Torres Strait Islander people . The Health plan emphasises the importance of culture in the health of Aboriginal and Torres Strait Islander people and the rights of individuals to a safe, healthy and empowered life. Its vision is for the Australian health system to be free of racism and inequity and all Aboriginal and Torres Strait Islander people to have access to health services that are effective, high quality, appropriate and affordable. This led to the publication of the Implementation plan for the National Aboriginal and Torres Strait Islander Health Plan 2013–2023 in 2015 , which outlines the strategies, actions and deliverables required for the Australian Government and other key stakeholders to implement the Health plan. The first National Aboriginal and Torres Strait Islander Cancer Framework (the Framework­) was released in 2015, to address disparities and improve cancer outcomes for Aboriginal and Torres Strait Islander people . It provides strategic direction by setting out seven priority areas for action and suggests enablers that may help in planning or reviewing strategies to address each of the priority areas. The Framework aims to improve cancer outcomes for Aboriginal and Torres Strait Islander people by ensuring timely access to good quality and appropriate cancer related services across the cancer continuum. In 2016, Cancer Australia released the National Framework for Gynaecological Cancer Control to guide future directions in national gynaecological cancer control to improve outcomes for women affected, as well as their families and carers . It aims to ensure the provision of best practice and culturally appropriate care to women across Australia by offering strategies across six priority areas, of which one pertains specifically to improving outcomes for Aboriginal and Torres Strait Islander women. In 2018, Cancer Australia released the Lung Cancer Framework: Principles for Best Practice Lung Cancer Care in Australia . It aims to improve the outcomes and experiences of people affected by lung cancer by supporting the uptake of five principles: patient-centred care; multidisciplinary care; timely access to evidence-based care; coordination, communication and continuity of care and data-driven improvements. strengthening the capacity of cancer-related services to meet the needs of Aboriginal and Torres Strait Islander people. Each of these priorities was accompanied by a number of enablers to assist in planning or reviewing strategies to address that priority. The enablers provide flexible approaches to meeting the priorities that allow for local context and needs. The development of the Framework has been responsible for gathering national support and agreement on the priorities and for creating a high level of expectation around the ability to address the growing cancer disparity . Cancer Australia has since commenced a number of projects and initiatives that focus on one or more of the priorities identified by the Framework. One project aims to identify critical success factors and effective approaches to increasing mammographic screening participation for Aboriginal and Torres Strait Islander women . A leadership group on Aboriginal and Torres Strait Islander cancer control tasked with driving a shared agenda to improve cancer outcomes has also been established . In addition, the development of a monitoring and reporting plan for the Framework is underway. Quality data are critical to understanding the variations in cancer care and outcomes of Aboriginal and Torres Strait Islander people, and to inform policy, service provision and clinical practice initiatives to improve those outcomes. However, it has been repeatedly reported in the literature and by the Framework, that current data are inadequate or incomplete, and there is a significant need for improved local, jurisdictional and national data on Aboriginal and Torres Strait Islander people with cancer [56, 149-151]. In particular, the need for primary healthcare services to address the under identification of Aboriginal and Torres Strait Islander status in data registries. A project currently underway in SA, which is likely to have relevance to other regions, aims to develop an integrated comprehensive, cancer monitoring and surveillance system for Aboriginal people, while also incorporating their experiences with cancer services . Both the Framework and the literature have identified a need for a more supportive and culturally appropriate approach across the cancer care continuum for Aboriginal and Torres Strait Islander people [56, 77, 151, 152]. The Wellbeing Framework for Aboriginal and Torres Strait Islander Peoples Living with Chronic Disease, (Wellbeing framework), aims to assist healthcare services to improve the quality of life and quality of care, as well as health outcomes, for Aboriginal and Torres Strait Islander people living with chronic disease . This addresses the identified need for more supportive and culturally appropriate care as it attempts to incorporate the social, emotional, cultural and spiritual aspects of health and wellbeing, as well as the physical aspects. having culturally safe primary healthcare services in place. best practice care that addresses the particular needs of a community. The Wellbeing framework suggests a number of practical and measurable applications for applying or achieving the underlying principles of each element. It has the capacity to be adapted by primary healthcare services, in consultation with the communities they serve, to more effectively meet the chronic and cancer care needs of their communities [153, 154]. share knowledge across the sector to leverage opportunities. Despite considerable improvements in cancer detection and treatment over recent decades, Aboriginal and Torres Strait Islander people diagnosed with cancer generally experience poorer outcomes than non-Indigenous people for an equivalent stage of disease [27, 97]. This is highlighted by statistics which showed that, despite lower rates of prevalence and hospitalisation for all cancers combined for Aboriginal and Torres Strait Islander people compared with non-Indigenous people, between 1998 and 2015, the age-standardised mortality rate ranged from 195 to 246 per 100,000 while the rate for non-Indigenous people decreased from 194 to 164 per 100,000 . Furthermore for 2007–2014, while 65% of non-Indigenous people had a chance of surviving five years after receiving a cancer diagnosis, only 50% of Aboriginal and Torres Strait Islander people did . The disparities are particularly pronounced for some specific cancers – for lung cancer the age-standardised incidence rate for Aboriginal and Torres Strait Islander people was twice that for non-Indigenous people, while for cervical cancer the rate was 2.5 times the rate for non-Indigenous people for 2009–2013 . The factors contributing to these poorer outcomes among Aboriginal and Torres Strait Islander people are complex. They reflect a broad range of historical, social and cultural determinants and the contribution of lifestyle and other health risk factors , combined with lower participation in screening programs, later diagnosis, lower uptake and completion of cancer treatment, and the presence of other chronic diseases [27, 98, 155]. 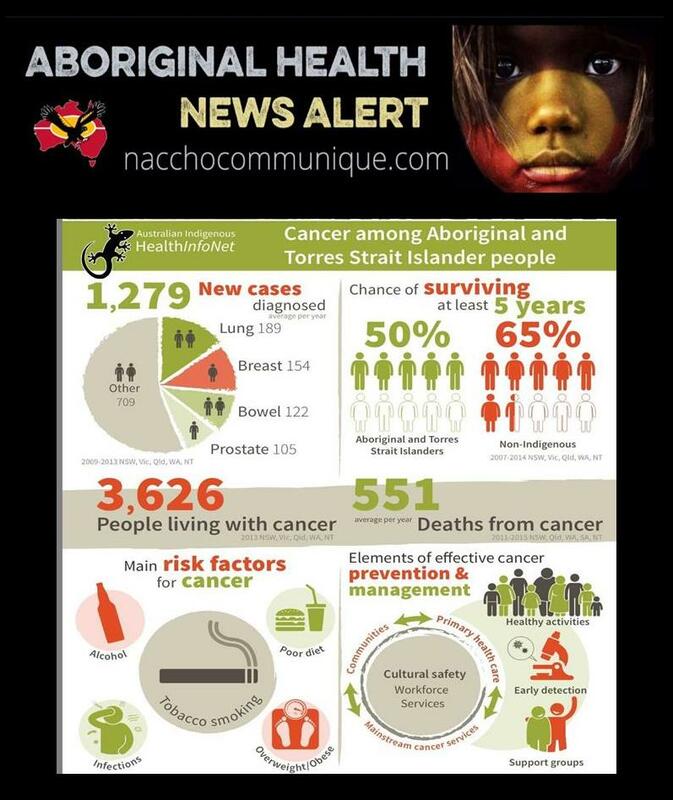 Addressing the various factors that contribute to the development of cancer among Aboriginal and Torres Strait Islander people is important, but improvements in some of these areas, particularly in reducing lifestyle and behavioural risk factors, are likely to take some time to be reflected in better outcomes. Current deficiencies in the prevention and management of cancer suggest there is considerable scope for better services that should lead to improvements in the short to medium term. Effective cancer prevention and management programs that are tailored to community needs and are culturally appropriate are vital for the current and future health of Aboriginal and Torres Strait Islander people [56, 57]. Providing effective cancer prevention and management also requires improved access to both high quality primary health care services and tertiary specialist services. Effective and innovative programs for the prevention and management of cancer among Aboriginal and Torres Strait Islander people do exist on an individual basis and, in some cases, the efforts made to engage Aboriginal and Torres Strait Islander people in screening programs, in particular, are impressive. However, a more coordinated, cohesive national approach is also required. Reducing the impact of cancer among Aboriginal and Torres Strait Islander people is a crucial aspect in ‘closing the gap’ in health outcomes. The National Aboriginal and Torres Strait Islander cancer framework  may be an important first step in addressing the current disparity in cancer outcomes and raises the probability of real progress being made. Cancer Australia has recently released the Optimal Care pathway for Aboriginal and Torres Strait Islander people which recommends new approaches to cancer care and with the aim of reducing disparities and improving outcomes and experiences for Aboriginal and Torres Strait Islander people with cancer . As encouraging as these developments are, substantial improvements will also depend upon the effective implementation of comprehensive strategies and policies that address the complexity of the factors underlying the disadvantages experienced by Aboriginal and Torres Strait Islander people. Action beyond the health service sector that addresses the broader historical, social and cultural determinants of health are also required if real progress is to be made .